Keep holding it in…keep holding it in…. Nope. Not working. Bawl your eyes out because the greatest baseball player of this generation is going to be out 6-8 weeks with a torn ligament in his left thumb. Got it all out of your system? Good. Then let’s begin. Mike Trout’s absence from the game due to injury will send shockwaves through baseball. It takes the Angels from a team that can maybe stay around .500 to a team that may not be able to stay above the A’s in the AL West cellar. It means that Aaron Judge is the frontrunner for AL MVP at this point in the season (though Trout could conceivably still win it. He’s that good). And for those of us lucky enough to get Mike Trout in our fantasy baseball leagues, it means we’re scrambling to find a replacement. Let’s be clear on one thing. On the field, and in fantasy, Mike Trout is irreplaceable. Just over two months into the season, the Angels CF had a 3.6 WAR according to Fangraphs – almost a full win ahead of anyone else. At the time of his injury he was in a battle for the league lead in home runs with Judge, and was in the top-10 in runs scored and batting average. His .461 OBP is still good for the lead across major league baseball. This is worse than the Cavs losing Lebron James. But still, the fantasy baseball season continues, and you have a hole to fill in your lineup with Trout on the DL. Who do you look to? A World Series hero, Fowler moved to Busch Stadium in the offseason, and has struggled in his new environs. His batting average is down from .276 last year to .228 this season, and he’s only scored 27 runs from the lead-off spot. His walk rate is down, and he’s only stolen one base this season. On the whole, it’s been a struggle thus far — and that’s good news for you. Fowler was a mid- to late-round pick in most drafts, but with his poor production he’s currently only owned in 54.5% of ESPN leagues. So why pick him up? Fowler’s quietly started to hit after a cold start to the season, going 9-for-30 in his last seven games, with two extra-base hits over that span. The Cardinals don’t exactly have a potent offense (25th in runs scored), but batting lead-off gives Fowler ample chance to bolster the runs category. Fowler is a low-risk replacement option. His floor isn’t much lower than he’s already playing right now, and there’s some upside that he can get closer to the form he showed last year. Who would’ve thought that two months into the season the Tampa Bay Rays would be pacing the league in home runs? Steven Souza, Jr. has been a considerable part of that, contributing 9 bombs on the season for the boys from the Trop. His strikeout numbers aren’t great (a 28.4% K-rate), but his average is more than passable at .277 and he contributes across the board with runs and RBIs. Amazingly enough, he’s only owned in 34.2% of ESPN leagues. If you act now, you can get him while he’s hot. Souza’s hit four home runs in his last seven, and sports a .444 average over that span. He’s bound to cool down eventually, and his floor is quite a bit lower than Fowler’s, but I see no reason not to ride Souza while he’s raking like this. And that Tampa Bay lineup will at least give him a chance to produce offensively. Remember back to Spring Training, when everyone kept talking about that young outfielder from Cleveland? That was Bradley Zimmer, who batted .358 during the spring and was banging on Terry Francona’s door for a spot in the Cleveland outfield. 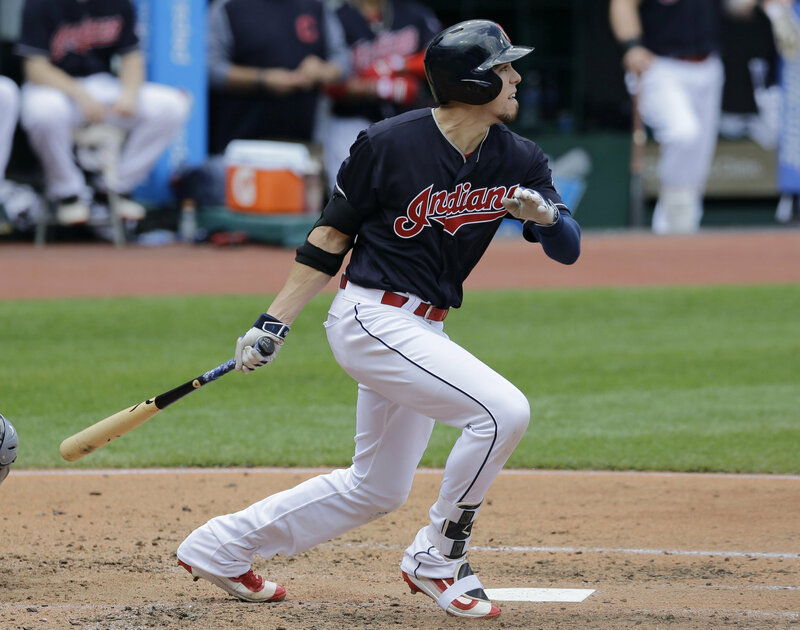 He started the season down in Triple-A Columbus, but thanks to some injuries to Tyler Naquin and Austin Jackson, Zimmer got his chance. In what has admittedly been a small sample size of just thirteen games, Zimmer has impressed. He currently sports a .314 average with 6 extra-base hits, including 2 bombs. Even better news for potential fantasy owners is Zimmer’s speed – he already has three stolen bases on the season. Zimmer has a lot of potential, but there are a few red flags. First of all, his counting stats like runs and RBI will be depressed due to his position in the lineup – Tito’s been keeping him in the bottom third of the order. Second, Zimmer has had a problem with strikeouts, striking out 30% of the time. Still, of the possible waiver-wire pickups in the outfield, Bradley Zimmer may have the highest ceiling of any player. These options admittedly aren’t great. You just can’t replace Mike Trout. You can only hope to stay competitive in your league until he returns — which, at least, will be in time for the fantasy playoffs.